How to Open EDB without Exchange? Why it's Demanded? On tracking down the recent IT industry it is observed that a large ratio of Exchange users is seeking for alternatives to read EDB mailboxes and public folders in absence of Exchange server. The page is focused over the constraints which forces users to open EDB files outside Exchange 2010 to 2003 edition and how to accomplish this mission. 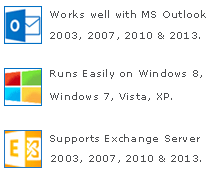 An Server-independent tool can handle all abovementioned reasons.Therefore, Download the best software that facilitates to read EDB files when Exchange server is unavailable (read all features). Technical Reasons which Forces Users to Open EDB without Exchange by Tool? User may access Exchange mailbox without connecting to server. No worries if server is temporarily or permanently down which makes EDB database, mailboxes and public folders inaccessible for all. Easily switch from local Exchange to Outlook, Office365, SharePoint etc, fulfill demands to convert and read unmounted EDB database. Scan & recover Dismounted or Disconnected database, which fails to mount every time and forces admin to open EDB without Exchange 2007, 2003 or 2010. A fully developed and trusted technique to solve the purpose is a simple conversion from EDB database to Outlook PST format. Only after extracting entire data from Exchange EDB mailboxes and public folders into PST file, it is possible to read EDB database entities. How to Convert EDB to Open without Exchange using a Great App? Deploy EDB Converter software, which proficiently extract EDB mailboxes and public folder in structured way and save them all in Outlook. After database extraction, open EDB without Exchange incorporating following items – mailbox stored emails, saved calendars, meetings, journals, contacts etc. Freeware edition of the software open Offline EDB completely in software window but extract only 15 items per folder. Rather invest full version to open outside Exchange server in Outlook.